The discovery, billed as “historic” and “sensational” by NIKU and others, was made using technology known as a georadar. 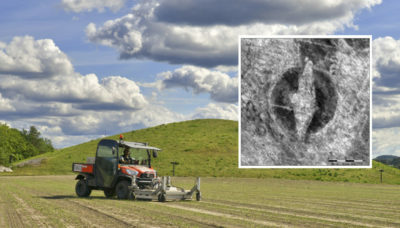 This mobile tool, looking like a mix between a golf cart and a tractor, detected an object with shape and size similar to those of the few Viking ships found earlier in Norway. “We’re certain that a ship is located down there, but it’s hard to determine how well preserved it is,” county conservator Morten Hanisch told state broadcaster NRK. Hanisch said the discovery is “fantastic” and very rare. The last time a Viking ship was found in Norway was in 1904. That ship, known as the Oseberg ship, resides in the Viking Ship Museum in Oslo , along with the Gokstad ship and the Tune ship. The museum is a major tourist attraction, but also a source of controversy over how and where to best preserve such millennium-old treasures. In addition to the remants of the Viking ship, archeologists found at least eight burial mounds and five residences known as longhouses. Experts have not yet dated the objects, saying only that it was common to bury prominent leaders in their ships throughout the younger Iron Age, from the sixth century up to 1030. Scientists have known for a long time that Jellstad is an ancient burial site. In 2015, a 1,500-year-old piece of jewellery was found in the area. But spokesmen said they were surprised at the scope of their most recent discovery, which was made near an area where they’ve been working for years. NIKU sources said much more work remains before a decision will be made on what to do next. With winter coming, excavations are not possible in the near term. One commentator suggested it would be better to decide on the future of Norway’s other three viking ships before unearthing a fourth one.